Filipino architect Gonzalo “Jun” Raymundo, Jr. who is based in Quezon City, Philippines was selected as one of the top ten finalists in the prestigious Guggenheim Art Shelter Competition. Click "Read More" to vote and view the rest of this entry. The Guggenheim Art Shelter Competition is an exhibition contest sponsored by the Guggenheim Museum and Google SketchUp. 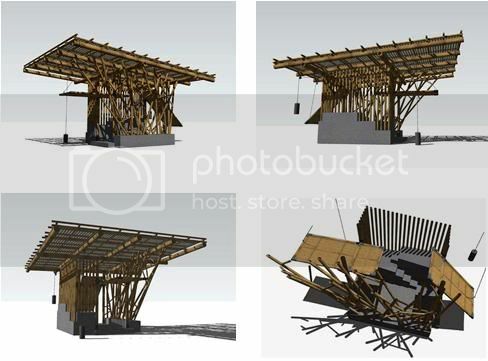 It is open to both amateur and professional designers who are challenged to come up with various 3D designs inspired from different shelters in any part of the world using Google SketchUp and Google Earth. Submissions were received from nearly 600 contestants in 68 countries around the world. Ten finalists were then drawn from this pool of contestants for the People's Prize Award, which will be chosen through an online public voting. Currently, Mr. Raymundo is leading the voting polls. The voting period will run until 10 October 2009. A link to the voting page can be accessed at here.